NZQA Mechanics Examination Papers..click below.. These are worth checking out !!! 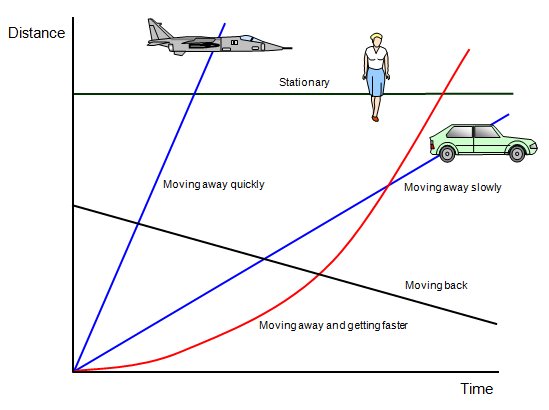 Objects have a speed, they travel a distance, have direction and could be accelerating or slowing down (decelerating). ​When describing the motion of an object like a car we use quantities like time, distance , speed and acceleration. SPEED - is the "rate" at which an object is moving. Because most times the direction of the object is always given- we use Velocity as our Speed. Velocity is speed in a particular direction. 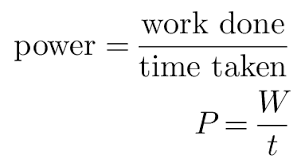 Change in time is another way of saying "time taken"
We can re-arrange the formula's above to find distance OR time. Instantaneous Speed - is the actual speed at any moment - for example if you looked down at the speedometer whilst travelling in the car - the speed at that particular instant in time would be termed the instantaneous speed of that object - it will usually change considerably during a car's journey. If it does NOT change then that objects speed is termed constant, uniform or steady ! ​These tell us about an objects type of SPEED !!!! These graphs plot the objects journey from start to end point. 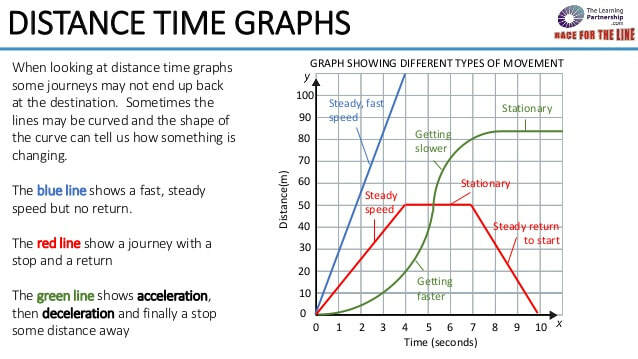 They can be used to calculate the average speed AND the SLOPE of the graph also gives us information about the objects type of motion/speed !! To calculate the speed we use rise/run or Distance/Time. ​We must be careful to only calculate the speed for the section asked - so check values carefully in questions!! The average speed can be calculated for any part of a journey by taking the change in distance and dividing by the change in time for that part of the journey. You can even do this for a curved line where the speed is changing, just remember that your result is the average speed in this case. 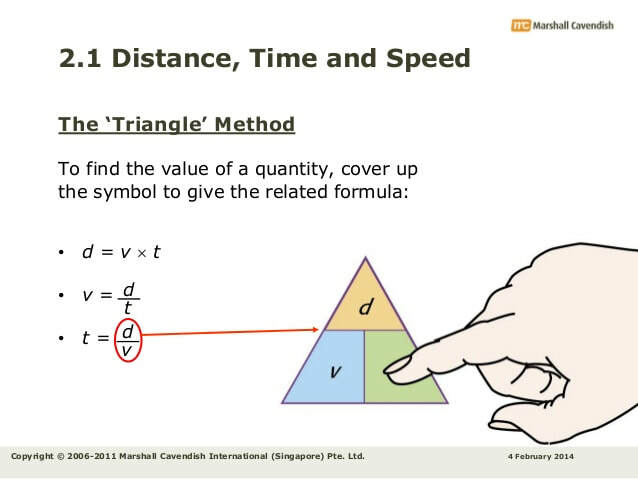 You may also notice that the formula for calculating speed is sometime written with small triangles Δ (the Greek letter delta) in front of d (distance) and t (time). The Δ is just short hand for "change in". Therefore Δt means "change in time"
During Part C- of the journey the object travels -8m in 3s'. It is travelling at a "constant velocity" of -2.7ms-1 back to its starting point, our reference point 0. Why can we use ''''velocity'''' instead of ''''speed''''? Because by labelling our two directions + and -, we now know which way our object is moving in 1-dimension, forwards or backwards. When an object speeds up we say it is accelerating. When an object is slowing down we say it is decelerating. Choose one way and stick with it ! It can be defined as the RATE at which the velocity (speed) of an object changes in a certain time ie: per second. When an object speeds up we say it is accelerating - when an object slows down we say it is decelerating. Calculating the TOTAL DISTANCE traveled from a SPEED-TIME graph ? 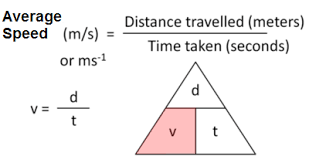 The area under the line in a velocity-time graph represents the distance travelled. To find the distance travelled in the graph above, you need to find the area of the light-blue triangle and the dark-blue rectangle. 16 + 48 = 64 m.
This is the total area under the distance-time graph. This area represents the distance covered. Forces are a push, pull or a twist. A Force is something which will change the motion of an object. A Force applied to an object may change the objects speed, direction or shape ! Forces act on everything !!! Often there is more than one force acting on an object. When this happens it is the resulting combination of all the forces acting that will affect the MOTION. The Resultant force is called the Net Force - F net . Forces acting in the same direction are added together - forces acting in opposite directions are subtracted and the difference/result becomes the NET FORCE ! A FORCE F - has both a size and direction. The size of the force is measured in Newtons N and the direction of the force is shown with an arrow ! When all the forces acting on an object are BALANCED - then the Net Force is zero. If the object is already moving then it will move at at CONSTANT speed. If it is not moving then it will remain STATIONARY. When forces acting on an object are UNBALANCED - there is a NET FORCE acting and the object will ACCELERATE and DECELERATE - in the direction of the Net Force! AIR RESISTANCE:...how does this work ? MASS is a measure of how much "matter" there is in an object. Mass remains the same even if the location does not ie: our mass it the same on earth as it would be on Mars. WEIGHT - is the downward force due to gravity on any mass ! So weight is a force ! If we are given the mass of an object we can work out its weight force /F net by multiplying it by 10. Eg: Zack is mountain biking down the Barnicoat. His total mass is 80 kg (him and bike together) Calculate the weight due to acceleration down the hill. 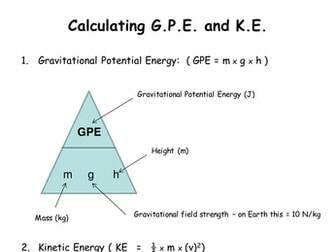 When we get scenarios with STAIRS, HILL's or LIFTING....this probably requires us to use the f= m x g in order to find the force as the first step 1 the working out !!! Then we can use the F = m x a equation. This is how much Force is put into a particular area. So the amount of pressure depends of 2 things. This is the type of Energy all MOVING objects have ! 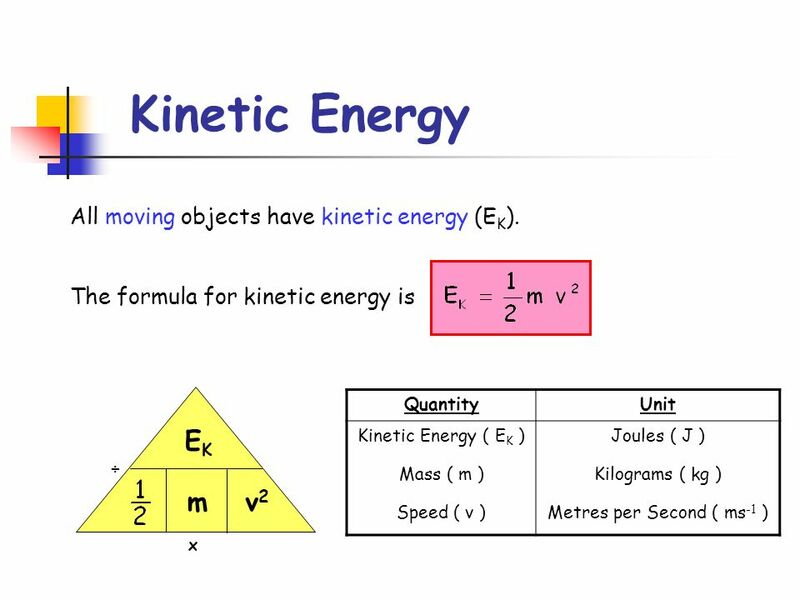 If the Mass is doubled (speed same) then the Kinetic E will be doubled. This is the Energy stored in an object whenever you lift or swing that object. The object gains whatever the energy was, that was needed to move it ie: it is often referred to as the energy an object has because of its "position". How do we calculate it ? In science WORK has a special meaning and defined as "the amount of Energy transferred"
It is also often explained as the "ability to do work". WORK is DONE (ie: energy is transferred) if a object is MOVED over a set distance in the direction of the Force. When WORK is done Energy is transferred - the "thing" doing the work loses E and the "thing" having the work done gains the Energy. Power is the rate at which work is done (or energy is transformed). It can be measured as the amount of work done (energy transformed) per second.